Will the Capitol Stiffen Penalty for Drivers Who Hit People Walking or Biking? If a driver clips a car’s sideview mirror in Colorado, the offender could get the same charge as a driver who strikes a person walking or biking: Careless driving. In other words, the current law values metal boxes as much as it values human beings. That could change — if state legislators want it to. 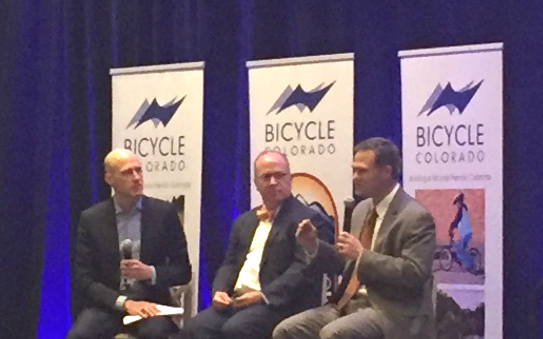 No one has introduced a bill, but Representative Mike Foote, a Democrat who reps Lafayette, spoke about the possibilities at the Colorado Bicycle Summit on Monday. Foote is also Boulder County’s deputy district attorney, so he has a front row seat to a lot of crash cases. Right now the penalty for careless driving is four points on a driver’s license. It takes 12 points to suspend a license. For perspective, reckless driving is eight points. DUI and hit-and-run charges can carry 12-point penalties. Careless driving deserves more than a slap on the wrist, said Bicycle Colorado Executive Director Dan Grunig. “That charge ends up a four-point penalty, so to see them driving the next day [after hitting someone], that doesn’t quite seem fair,” he said. According to Foote, there isn’t any middle ground available to prosecutors that enables them to charge drivers with a more serious offense when carelessness leads to serious injury. Foote seemed to be saying that hitting someone unintentionally shouldn’t automatically absolve a driver of negligence or recklessness. Tougher penalties for drivers who harm pedestrians or cyclists could be politically challenging. Grunig led a contingent of advocates to the Capitol on Tuesday to informally speak with legislators and build some political will. Foote didn’t commit to introducing a bill, but said emailing your legislator will go a long way.